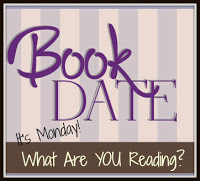 Book By Book: It's Monday 1/28! What Are You Reading? I'll be very interested in hearing what you thought of All the Crooked Saints once you're finished. I haven't started this one, yet -- still looking it over. I'm actually reading #IMWAYR posts while crying my way through the ALA award's ceremony (streaming), but it just makes me that much more happy to be part of this community. Hope you have a wonderful reading week, Sue! All the Crooked Saints is growing on me - not my kind of thing typically, but Stiefvater is just so amazing. I also thought I'd hate her Shiver series but finally gave in to the hype and LOVED it - quickly flew through the entire series! I've been wondering if I should give Crooked Saints a try. Still not sure if it's for me. I would say if you like magical realism, then definitely. And if not, well you might still give it a try - I'm really not a fan of MR but this one is growing on me - she's such a good writer and SO clever! Reading your description of hanging with your husband and staying up late (and drinking tea while eating chocolate), I am realizing more and more how similar we are! I want to read All the Crooked Saints. I have read almost all of her other books. I imagine it is good! I didn't realize it was set in Colorado! ha ha yes, I do think we have a lot in common, Ricki! I was reluctant to read this one but am enjoying it. I’m on a waitlist for All The Crooked Saints, so I hope it’s good. It sounds very bizarre. Have a great week! Yup, that about says it - it is definitely bizarre! But it has really grown on me - she's just such a talented writer! Something warm and fun is often needed after a serious read. Ah yes, the mind does not like to turn off when we get too involved in the evening, that wind down time is important. Yes, definitely - I need my evening downtime, for sure! I have all of Stiefvater's books, & All the Crooked Saints is one I have, too, since it published. Your description has intrigued me, but I have so many on my list! Someday! Take care, Sue, not too much reading late! Steifvater can go surreal sometimes :) I'll look forward to your final thoughts. Sounds like a good week of reading ahead. I am reading the Accidental Further Adventures of the 100-Year-Old Man. Oh, I've heard good things about that one, Helen! Enjoy! I have mixed feelings about reading All The Crooked Saints because I love some of her work, (Read all the Raven Boys) and can't stand others (Shiver). Being Mortal is such a powerful book. The part that broke my heart most was how much people had to give up when they go into care.